75 Commercial Real Estate and Properties in Victoria Country West are listed in 8 categories. We have 29 Offices for Sale & Lease , 16 Industrial Warehouses for Sale & Lease , 12 Retail Shops for Sale & Lease , 7 Hotels and Leisure for Sale & Lease , 4 Development Lands for Sale & Lease and 3 Commercial Farms for Sale & Lease . Excellent Lighting | Cafes And Shops Nearby | Creative Co-working Hub $1025pw | 10 Person Works..
PROPERTY OVERVIEW $1025pw Price incl. Discover a new way of working at this newly opened coworking office in Ballarat. This collaborative environment is an affordable and professional office solution that fuels social, mental and business wellbeing through the careful arrangement of dedicated workspaces and comfy home style communal areas. Every workspace is accessible 24/7 and set up with Wi Fi and a mailing address while members enjoy free tea and coffee from the kitchen and the freedom to take a break or socialise with other coworkers on a whim. The bright and airy office has great views of Ballarat and the financial outlook is just as good with simple and inclusive monthly billing. There’s also a dedicated meeting room that can be set up in a variety of formats to suit your needs – it features a TV, internet and video conferencing equipment. If you’re looking for a motivational and energising environment where you work better, this could be just the solution – enquire now for flexible terms and zero hassle. This brand new coworking centre is situated in the very heart of Ballarat – the perfect location for small businesses, freelancers and startups who want to be inspired by the city’s cultural heritage and quaint urban landscape. Convenience is also key and you'll enjoy a smooth running working day as you sit just around the corner from Central Square Shopping Centre and a wide variety of cafes, supermarkets, shops and restaurants. Ballarat Train Station is a straight five minute walk so this coworking centre is an excellent option for people looking to establish an accessible satellite office or for anyone whose clients are based in Melbourne or wider Victoria. The advertised office space is perfect for a team of 10. If you need more or less space, we have over 30,000 furnished workspaces all over the world suitable for a team of 1 to 200+. Our award winning team offer a free service that will help you find the perfect solution for your needs, so reach out if you need more help. What you get for your weekly rent , 24/7 Access , Access to internal breakout areas , Access to kitchen facilities , Access to secure printer and scanner , Building outgoings included , Electricity usage included , Flexible terms , FREE use of the meeting rooms , One simple bill for everything related to your workspace , Premium coffee/tea facilities , Regular cleaning , Secure high speed Internet Building features , Abundance of natural light , Air conditioning , Boutique low rise buidling , Car parking in building (Paid) , Disabled access and facilities , New fit out , Taxi / Uber stand close to building 15 min walk to Coles Ballarat (Victoria Street) 600m to Ballarat Train Station 800m to White Flat Recreation Reserve WHO IS OFFICE HUB? Office Hub has largest collection of shared office space, sublet office space, creative coworking office space and serviced offices, perfect for 1 200 employees. Let us take you on a tour of all the spaces that fit your needs and budget. Our service is complimentary and we work for you and the landlord to negotiate the most competitive deal in the market. Let us show you how shared and serviced offices can be the perfect solution for your business. www.office hub.com.au www.office hub.co.nz Conditions apply A portion of the square meterage factors in access to shared space. The advertised price includes any incentives offered based on a 12 month agreement. If a shorter period is agreed to please note the price may increase accordingly. This promotional offer for new tenants only and may be withdrawn at any time due to space availability. This is an extraordinary opportunity to secure 7 separates titles, to be sold as one (1) Lot, in the ever popular East Beach precinct of Port Fairy. Eastern Beach Holiday Units is a thriving, long established holiday accommodation business, offering affordable short and long term holiday stays, catering to the buoyant Port Fairy tourism market. Situated on a prime corner allotment, just 100 meters to magnificent East Beach, this is the chance to own your own business whilst living in a wonderful beachside location. Consistently gaining high recommendations on travel sites such as Tripadvisor and booking.com, the property consists of six comfortable 2 bedroom apartments that all feature open plan living, kitchen, dining, main bathroom and 2 generously proportioned bedrooms with BIR’s. A main residence spans two levels, with the first floor offering a spacious open plan living area, which also includes a well equipped kitchen, 3 bedrooms all with BIR’s and a main bathroom. A set of sliding doors leads to an outdoor entertaining area where you can relax and take in the sounds and smells of the ocean. Downstairs is the reception area, single car garage/laundry, several storage options and a workshop. The entire property will be sold on a walk in walk out basis, which also includes the comfort of immediate revenue by way of forward bookings into 2019. The property is set amongst 1157m2 (approx.) of manicured grounds, which includes a communal outdoor entertaining area for guests, guest laundry and off street parking for each apartment. The astute purchaser will also recognise the scope to further develop the surrounding space, STCA. Whether you are seeking a new lifestyle or investment and with limited accommodation competition on the East Beach side of the Moyne river, the Eastern Beach Holiday Units is an outstanding and rare offering not to be overlooked. Further details are available to genuine enquiries only, upon the return of a signed Confidentiality Agreement and inspections are to be arranged by appointment. The Essential Details. • 6 x 2 bedroom, 1 bathroom self contained apartments. • Main residence 3 bedrooms, 1 bathroom, open plan living. • Property to be sold on a Walk in Walk out basis. • Full training to be provided to the new owners. • The freehold is being sold as a going concern, no GST. • Fully computerised and functional booking system with live booking facility. • Limited competitors in this market • Website and Marketing of high quality to be included. Area Highlights. Continuing • Located in the historic & popular coastal township of Port Fairy. • Situated on a high visibility corner site 100 meters from magnificent East Beach. • Short distance from shops, cafes and the famous Port Fairy Golf Course. Multi Use Building - Central $95,000 plus GST and o.g\..
A rare opportunity to purchase an iconic, freehold Hotel, located in a Ballarat district growth area. Currently not operating, a great opportunity exists here to get in on the "ground floor". The Royal Mail Hotel, built in 1924 consists of a "classic" public bar, oozing with character as well a cosy lounge, a spacious, adjoining Bistro and "The Legends" room, along with a built in "coffee and cake" bar. There is also a newly refurbished Function / Alfresco room with it's own bar, toilet and BBQ facilities. This spacious room seats 72 people. There are 2 smoking areas, one off the main bar and the other off the Alfresco area. Great opportunity for an owner occupier or investor. Lease enquiries also welcome. Fully Furnished | Professional Space | Free Street Parking $150pw | 2 Person Workspa..
PROPERTY OVERVIEW $150pw Price incl. Cost effective shared office space in Mount Clear with conferencing tech and car parking. This modern and well presented space has a number of internal private offices for rent, each with desks, draws and chairs. NBN 100/40 internet comes inclusive subject to reasonable use and the building has a manned reception where your visitors will be greeted and your deliveries taken care of. The smart boardroom gives an excellent place to hold catch ups or meetings with no additional costs and it has excellent conferencing technology so potential clients will always be within reach. The building is tenanted by a professional services company which is hoping to find a respectful business to share their economical office space in Mount Clear. This standalone building sits on Whitehorse Road just off the Geelong Road roundabout on the way to Ballarat. There is a large public car park to the rear of the building currently with no time limits so you’ll never need to worry about finding parking. The office is part of a small close knit commercial precinct with an IGA, Australia Post, Subway, butcher’s, bakery, nail salon and NAB bank for fantastic local convenience. The low rise redbrick building has been extended to create a second level and features toilets and a shared kitchen with a fridge, microwave and kettle. This office could work for any local business, freelancer or team needing close access to Ballarat (7.2km away). The advertised office space is perfect for a team of 2. If you need more or less space, we have over 30,000 furnished workspaces all over the world suitable for a team of 1 to 200+. Our award winning team offer a free service that will help you find the perfect solution for your needs, so reach out if you need more help. What you get for your weekly rent , 24/7 Access , 24/7 Security , Access to internal breakout areas , Access to kitchen facilities , Access to secure printer and scanner , A fully furnished office suite , Building outgoings included , Dedicated receptionist to manage your calls and greet your guests , Electricity usage included , FREE use of community meeting rooms , One simple bill for everything related to your workspace , Regular cleaning , Secure high speed Internet Building features , Air conditioning , Car parking Street (Free) , Dedicated men and ladies bathrooms , Gym and fitness centre close by , Print, scan and copy facilities , Retail and shopping malls nearby , Professional environment , Company signage , Company Branding in Foyer & Reception Adjacent to Midvale Shopping Centre 2 minutes walk from Anytime Fitness gym 190m to IGA convenience store 7.2km to Ballarat 119km to Melbourne WHO IS OFFICE HUB? Office Hub has largest collection of shared office space, sublet office space, creative coworking office space and serviced offices, perfect for 1 200 employees. Let us take you on a tour of all the spaces that fit your needs and budget. Our service is complimentary and we work for you and the landlord to negotiate the most competitive deal in the market. Let us show you how shared and serviced offices can be the perfect solution for your business. www.office hub.com.au www.office hub.co.nz Conditions apply A portion of the square meterage factors in access to shared space. The advertised price includes any incentives offered based on a 12 month agreement. If a shorter period is agreed to please note the price may increase accordingly. This promotional offer for new tenants only and may be withdrawn at any time due to space availability. Economical Workspace | Ideal Workspace | Regular Cleaning $1640pw | 16 Person Works..
PROPERTY OVERVIEW $1640pw Price incl. Discover a new way of working at this newly opened coworking office in Ballarat. This collaborative environment is an affordable and professional office solution that fuels social, mental and business wellbeing through the careful arrangement of dedicated workspaces and comfy home style communal areas. Every workspace is accessible 24/7 and set up with Wi Fi and a mailing address while members enjoy free tea and coffee from the kitchen and the freedom to take a break or socialise with other coworkers on a whim. The bright and airy office has great views of Ballarat and the financial outlook is just as good with simple and inclusive monthly billing. There’s also a dedicated meeting room that can be set up in a variety of formats to suit your needs – it features a TV, internet and video conferencing equipment. If you’re looking for a motivational and energising environment where you work better, this could be just the solution – enquire now for flexible terms and zero hassle. This brand new coworking centre is situated in the very heart of Ballarat – the perfect location for small businesses, freelancers and startups who want to be inspired by the city’s cultural heritage and quaint urban landscape. Convenience is also key and you'll enjoy a smooth running working day as you sit just around the corner from Central Square Shopping Centre and a wide variety of cafes, supermarkets, shops and restaurants. 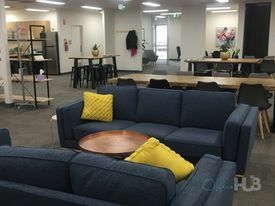 Ballarat Train Station is a straight five minute walk so this coworking centre is an excellent option for people looking to establish an accessible satellite office or for anyone whose clients are based in Melbourne or wider Victoria. The advertised office space is perfect for a team of 16. If you need more or less space, we have over 30,000 furnished workspaces all over the world suitable for a team of 1 to 200+. Our award winning team offer a free service that will help you find the perfect solution for your needs, so reach out if you need more help. What you get for your weekly rent , 24/7 Access , Access to internal breakout areas , Access to kitchen facilities , Access to secure printer and scanner , Building outgoings included , Electricity usage included , Flexible terms , FREE use of the meeting rooms , One simple bill for everything related to your workspace , Premium coffee/tea facilities , Regular cleaning , Secure high speed Internet Building features , Abundance of natural light , Air conditioning , Boutique low rise buidling , Car parking in building (Paid) , Disabled access and facilities , New fit out , Taxi / Uber stand close to building 15 min walk to Coles Ballarat (Victoria Street) 600m to Ballarat Train Station 800m to White Flat Recreation Reserve WHO IS OFFICE HUB? Office Hub has largest collection of shared office space, sublet office space, creative coworking office space and serviced offices, perfect for 1 200 employees. Let us take you on a tour of all the spaces that fit your needs and budget. Our service is complimentary and we work for you and the landlord to negotiate the most competitive deal in the market. Let us show you how shared and serviced offices can be the perfect solution for your business. www.office hub.com.au www.office hub.co.nz Conditions apply A portion of the square meterage factors in access to shared space. The advertised price includes any incentives offered based on a 12 month agreement. If a shorter period is agreed to please note the price may increase accordingly. This promotional offer for new tenants only and may be withdrawn at any time due to space availability. Large Windows | Fabulous Views | Incentives For 12+ Months $518pw | 5 Person Workspa..
PROPERTY OVERVIEW $518pw Price incl. Discover a new way of working at this newly opened coworking office in Ballarat. This collaborative environment is an affordable and professional office solution that fuels social, mental and business wellbeing through the careful arrangement of dedicated workspaces and comfy home style communal areas. Every workspace is accessible 24/7 and set up with Wi Fi and a mailing address while members enjoy free tea and coffee from the kitchen and the freedom to take a break or socialise with other coworkers on a whim. The bright and airy office has great views of Ballarat and the financial outlook is just as good with simple and inclusive monthly billing. There’s also a dedicated meeting room that can be set up in a variety of formats to suit your needs – it features a TV, internet and video conferencing equipment. If you’re looking for a motivational and energising environment where you work better, this could be just the solution – enquire now for flexible terms and zero hassle. This brand new coworking centre is situated in the very heart of Ballarat – the perfect location for small businesses, freelancers and startups who want to be inspired by the city’s cultural heritage and quaint urban landscape. Convenience is also key and you'll enjoy a smooth running working day as you sit just around the corner from Central Square Shopping Centre and a wide variety of cafes, supermarkets, shops and restaurants. Ballarat Train Station is a straight five minute walk so this coworking centre is an excellent option for people looking to establish an accessible satellite office or for anyone whose clients are based in Melbourne or wider Victoria. The advertised office space is perfect for a team of 5. If you need more or less space, we have over 30,000 furnished workspaces all over the world suitable for a team of 1 to 200+. Our award winning team offer a free service that will help you find the perfect solution for your needs, so reach out if you need more help. What you get for your weekly rent , 24/7 Access , Access to internal breakout areas , Access to kitchen facilities , Access to secure printer and scanner , Building outgoings included , Electricity usage included , Flexible terms , FREE use of the meeting rooms , One simple bill for everything related to your workspace , Premium coffee/tea facilities , Regular cleaning , Secure high speed Internet Building features , Abundance of natural light , Air conditioning , Boutique low rise buidling , Car parking in building (Paid) , Disabled access and facilities , New fit out , Taxi / Uber stand close to building 15 min walk to Coles Ballarat (Victoria Street) 600m to Ballarat Train Station 800m to White Flat Recreation Reserve WHO IS OFFICE HUB? Office Hub has largest collection of shared office space, sublet office space, creative coworking office space and serviced offices, perfect for 1 200 employees. Let us take you on a tour of all the spaces that fit your needs and budget. Our service is complimentary and we work for you and the landlord to negotiate the most competitive deal in the market. Let us show you how shared and serviced offices can be the perfect solution for your business. www.office hub.com.au www.office hub.co.nz Conditions apply A portion of the square meterage factors in access to shared space. The advertised price includes any incentives offered based on a 12 month agreement. If a shorter period is agreed to please note the price may increase accordingly. This promotional offer for new tenants only and may be withdrawn at any time due to space availability. Economical Workspace | Dedicated Receptionist | Regular Cleaning $300pw | 4 Person Workspa..
PROPERTY OVERVIEW $300pw Price incl. Cost effective shared office space in Mount Clear with conferencing tech and car parking. This modern and well presented space has a number of internal private offices for rent, each with desks, draws and chairs. NBN 100/40 internet comes inclusive subject to reasonable use and the building has a manned reception where your visitors will be greeted and your deliveries taken care of. The smart boardroom gives an excellent place to hold catch ups or meetings with no additional costs and it has excellent conferencing technology so potential clients will always be within reach. The building is tenanted by a professional services company which is hoping to find a respectful business to share their economical office space in Mount Clear. This standalone building sits on Whitehorse Road just off the Geelong Road roundabout on the way to Ballarat. There is a large public car park to the rear of the building currently with no time limits so you’ll never need to worry about finding parking. The office is part of a small close knit commercial precinct with an IGA, Australia Post, Subway, butcher’s, bakery, nail salon and NAB bank for fantastic local convenience. The low rise redbrick building has been extended to create a second level and features toilets and a shared kitchen with a fridge, microwave and kettle. This office could work for any local business, freelancer or team needing close access to Ballarat (7.2km away). The advertised office space is perfect for a team of 4. If you need more or less space, we have over 30,000 furnished workspaces all over the world suitable for a team of 1 to 200+. Our award winning team offer a free service that will help you find the perfect solution for your needs, so reach out if you need more help. What you get for your weekly rent , 24/7 Access , 24/7 Security , Access to internal breakout areas , Access to kitchen facilities , Access to secure printer and scanner , A fully furnished office suite , Building outgoings included , Dedicated receptionist to manage your calls and greet your guests , Electricity usage included , FREE use of community meeting rooms , One simple bill for everything related to your workspace , Regular cleaning , Secure high speed Internet Building features , Air conditioning , Car parking Street (Free) , Dedicated men and ladies bathrooms , Gym and fitness centre close by , Print, scan and copy facilities , Retail and shopping malls nearby , Professional environment , Company signage , Company Branding in Foyer & Reception Adjacent to Midvale Shopping Centre 2 minutes walk from Anytime Fitness gym 190m to IGA convenience store 7.2km to Ballarat 119km to Melbourne WHO IS OFFICE HUB? Office Hub has largest collection of shared office space, sublet office space, creative coworking office space and serviced offices, perfect for 1 200 employees. Let us take you on a tour of all the spaces that fit your needs and budget. Our service is complimentary and we work for you and the landlord to negotiate the most competitive deal in the market. Let us show you how shared and serviced offices can be the perfect solution for your business. www.office hub.com.au www.office hub.co.nz Conditions apply A portion of the square meterage factors in access to shared space. The advertised price includes any incentives offered based on a 12 month agreement. If a shorter period is agreed to please note the price may increase accordingly. This promotional offer for new tenants only and may be withdrawn at any time due to space availability. Brookes Timber and Hardware is a well known Port Fairy business that has been family owned and operated for over 42 years. Brookes Hardware loyal customer base consists of a wide variety of tradesmen & the general public from Port Fairy and the surrounding district. Occupying a prime position in the main street of Port Fairy the hardware store has a huge product range including General Hardware, Garden Supplies, Plumbing and Electrical Supplies, Timber Yard, Paints, Giftware, Tool Sales and is a Bi Rite Electrical store. The business has proven to be very profitable for the current owners, over the past 42 years and is a great opportunity for a new owner to further enhance the business. Further information & lease details are available to genuine enquiries only, upon the return of a signed Confidentiality Agreement. An opportunity to purchase the Freehold is also available on completion of the sale of business. 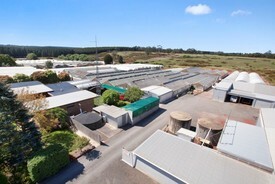 Brookes Hardware occupies one of the largest Commercial Holdings ever on offer in the Central area of Port Fairy. This prime parcel of land, zoned commercial, offers 2 street frontages and is located in the main retail hub of Port Fairy. • Brookes Hardware store successfully family owned and operated for 42 years. • Occupying prime retail position in the main street of Port Fairy. • Great reputation for service and competitive prices. • Full training offered by existing owner for a period to be negotiated • Opportunity to purchase Freehold on completion of the sale of business. 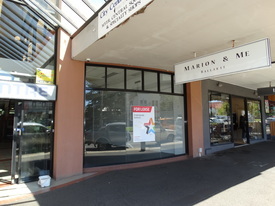 Offered For Sale with vacant possession 77m2 plus use of arcade space Premiere retail block in Ballarat? Quality National tenants nearby, inc. Gaz Man, Snitz, NAB etc. 3 Doors from Myer Arcade accesses Myer, Target, Block Arcade, Car Park etc. Hotel Leasehold / Business For Sale $430,000 inc. Goodwill an.. This is a unique opportunity to buy a very profitable motel from genuine, motivated Vendors. We are providing a rare opportunity to purchase their high income and hugely profitable motel business in an area famed for its geographic features, ambience and lifestyle. This immaculately presented motel with main road frontage, is located on a major highway, just a stone’s throw from the Grampians tourist region. The motel presides over 20 acres of peaceful gum treed acres with all units and the restaurant overlooking a tranquil man made lake abundant with bird life, native flora and fauna. Truly a unique presentation. The Grampians area is acclaimed for its diverse tourist attractions including wild flower events, spectacular food, wine & folk festivals, hiking, wineries, horse racing, sporting carnivals and much more to ensure consistent tourist patronage. The motel also enjoys high patronage from repeat and loyal business people, tradespersons, coach groups, travellers and visitors touring the region that is rated in the top 10 tourist destinations in Victoria. MOTEL DESCRIPTION The motel has 29 ground floor units and all are set back from the main road ensuring exquisite serenity and a pleasure to stay in. It has been updated to provide superior accommodation that enables guests to enjoy, relax and fully experience the wonderful setting. Comprising 13 Deluxe Standard Queen/Twin units, 7 Standard Queen Family units, 1 Deluxe extra–large Family Spa Suite, 1 King Spa Suite and 1 Disabled Suite. For longer stays, this motel offers 1 self contained spacious 3 bedroom Suite a configuration choice not easily found. This high income, successful motel also comes with a modern and spacious 3 bedroom, 2 bathroom residence enjoying a large living area and private courtyard. The motel further boasts a beautifully presented, recently renovated, 70 seat fully licenced restaurant. With picture windows curving around half the restaurant, guests have a magnificent view of the lakes and gardens. During summer, guests can enjoy dining on the deck Al fresco, all while enjoying the serene park like surroundings. The tennis court and heated indoor pool further complements this unique money making business which can only be fully appreciated by personal inspection. Other Key Features of this exceptional motel include: Increasing Gross Income that presently exceeds $700,000. 27 Year Lease with industry based rental to ensure high nett profit. Huge online presence with excellent profiles on Booking.com, TripAdvisor, Facebook, etc. Fully functional website with online RMS booking and enquiry system. Motel Construction being of Brick/Timber with car parking area able to cater for tour group bookings. Onsite laundry, room service, Wi Fi and more Linen, bedding and plant are all of a high standard. 70 seat fully licenced restaurant and cocktail bar that is extremely popular with local diners, motel guests and function engagements. Experienced operators will substantially increase business profitability from this flourishing restaurant. Infrastructure projects and industry expansion in the region will ensure continued income growth. This unique motel with extensive future bookings and a profitable restaurant, provides a rare opportunity for an experienced couple or family partnership to realise a unique opportunity to secure their financial future. Bank finance is available to approved purchasers with all financials available to genuine purchasers. For more information on this outstanding business please contact VENDOR DIRECT as detailed. Pleasant Park - Facing Sturt St $25,000 p.a. plus GST and..
Oddfellows Restaurant Bar And Cafe - Colac $210,000 - Vendors are wi..
~~Oddfellows is a well established restaurant for over 7 years in the heart of Colac Otway Shire Area’s Central Business District Colac. It is situated in a beautiful heritage building built by British Independent Order of Odd Fellows (IOOF) in 1891. The quality and lively surrounds give a quirky and stylish atmosphere to suit many cuisines and menu styles. Business: • Modern Australian Cuisine • Focus on local produce and wines • Situated on the corner facing the memorial park • Strong attraction to tourists • Live entertainment • Wide open outside view Building: • Main dining area seating 70 • Private dining area seating 30 • Antique Log burner in private dining area • Front and Side L shape courtyard seating 60 • Large L shape bar area • Substantial commercial kitchen • Separate office area • Well maintained throughout Lease: • 3 years plus 5 X 5 years • Low rent Liquor Licence: • Fully licensed • Courtyards are included in the ‘red line’ Parking • Private car park for 20 cars and bins Deliveries: • All deliveries come through the back door The Venue close to The Great Ocean Road has a proven record as a destination. On a prominent corner in the heart of the city, it is rated as one the best establishments in the area, well established and well known, not in the city in fact in the whole area. The Information Memorandum contains the liquor licence, lease, financials and a plant and equipment inventory – available upon signing a confidentiality agreement. An exciting opportunity exists to acquire a large parcel of land, with a variety of future development possibilities, within the township of Port Fairy. The property comprises of an outstanding, prime corner allotment of 5703m2 approx and has wide frontage to the Princes Hwy and Philip Street. Currently operating as the Catalina Caravan Park the property consists of; • 5703 m2 approx allotment. • Commercial space operating as a Takeaway/General Store. • 4 bedroom, 2 bathroom home with swimming pool. • 2 bedroom cabin with ensuite x2. • 1 bedroom cabins x 5. • 25 powered caravan sites. • 12 – 15 unpowered caravan sites. • 2 bedroom self contained brick unit. For further details including inspection arrangements please contact: Paul Ross 0439 681 900 or Di MacKirdy 0400 625 501. Licensed Premises Ballarat Central $90,000 plus GST and outg.. This property located at 19 Sheehans lane Ballarat offers 44 acres of land with a business and a residency. The Land has commercial licence to extract water, the licence is for 10megalitres but we can increase it to 20 megalitres,this will allow anyone to establish a bottling plant for water or any kind of beverages. It is situated above the biggest and most pristine aquifer in Ballarat. The Land can have various uses from agricultural to future subdivision once zoning is changed also additional warehousing facilities can be build subject to council approval. There is also a destroyed house on the Land that will allow you to start repairing and build a residence without council approval. Please do not hesitate to contact me any time on 0414 818 317. Commercial/Retail premises for FOR SALE. With prime Western Highway exposure, large showroom 2 bay workshop, toilet amenities, kitchenette, canopy plus 2 Bedroom brick unit & more. Ideal busy location corner of Western Highway & Grampians tourist road for plenty of passing trade. Around 243.25 sq.m. building. Former caf & service station, plenty of parking hard stand area. Great affordable business opportunity. Enquire Now. This vacant Building Block in the CBD area fronting busy Vincent Street is a great business opportunity. Around 568 sq.m. it is the only vacant land in the business district. Just 50m to busy Barkly Street, close to supermarkets and amp; shopping strip. Rear access to laneway for ease of parking. Don't hesitate great opportunity. Are you looking for an office to rent? Then look no further. Check out this modern, state of the art, purpose built Commercial Office building. Great fit out with a large reception, six (6) private offices, meeting/training room , staff amenities , data storage plus car parking spaces off rear lane way. This is ready for your occupancy so do not delay. Enquire Now.